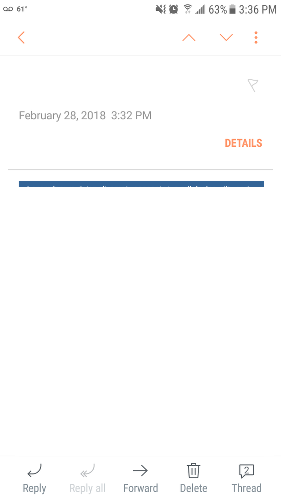 We recently had a number of users complaining of our emails not showing up when viewed in the Samsung Email app on their various Samsung Android phones (Galaxy S6, S7, S8). This issue cropped up within the last couple of weeks, so it may be related to a recent update to the app or the webview package it uses. All but the very top sliver of the message does not render. For us, the solution was strange but simple. 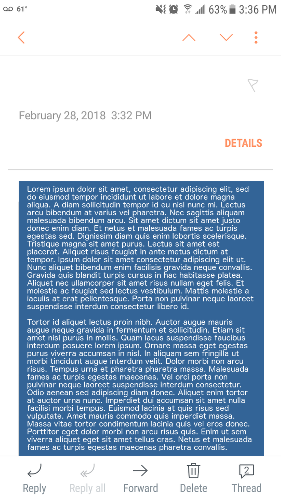 A lot of trial and error led us to determine that the align="left" on that top-level table was what caused Samsung Email to collapse most of the message content, leaving only that sliver at the top. Removing align=left" from that top-level table (leaving it on all other tables in the content) didn't have any adverse effect on other clients, either (at least according to our Litmus tests!). By the way, at the time Litmus's tests for Samsung Email weren't exhibiting the problem. Maybe their app hadn't been updated to the latest version yet. I don't know whether it would exhibit the bug now. I thought this worth sharing in case it could help anyone else having the same problem. In short: If your emails are showing up blank or collapsed in Samsung Email, see if you have align="left" or similar on a top-level table tag. If so, try removing it.